All the good things I have going on in my life is the result of falling in love with my wife, Rina. Let's enumerate: As you may have noticed, I have a daughter that is not just beautiful, but incredibly sharp and well mannered.. Something I attribute to Rina's role as a mother. My relationship with my family is better than ever because of her being the calming voice of reason that I never had in my life before. 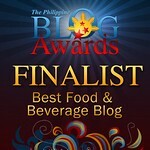 And lastly, I don't know if I've said this enough, but without Rina, there is no Pickiest Eater Blog. It was her fondness for food photography, this blog would never have gotten started. Not to mention, I can't take pictures for crap, so yeah, the brains behind this operation is really Rina.. I'm just the "Pretty Face". Fine, maybe just "The Face". I'm professing my love for my wife right now because we were set to celebrate our 7th year anniversary last January 6, but it never came to fruition because I got stuck in line trying to renew my license. I had planned on taking her out for a nice steak dinner at a posh place, but because I arrived a little bit later than I should have at the LTO Satellite office, we ended up having a meal at SM Pasig Center. Not the most romantic place to take your wife for your 7th year anniversary, I know, but the circumstances couldn't be helped. But the funny part is, it didn't matter to Rina.. AT ALL. She kept insisting that it doesn't matter where we eat.. She was fine with it, as long as we were together. But that's precisely why I fell in love with her.. How she manages to find contentment and appreciation in everything in life.. Even with the most mundane things. One time, for a present, I asked what she preferred: a P4,000 Gift certificate to Mango or P4,000 Gift certificate to Zara. She answered, "Two thousand pesos cash for St. Francis Square". But I wanted to show her how much I appreciate the way she takes care of Rain and I. 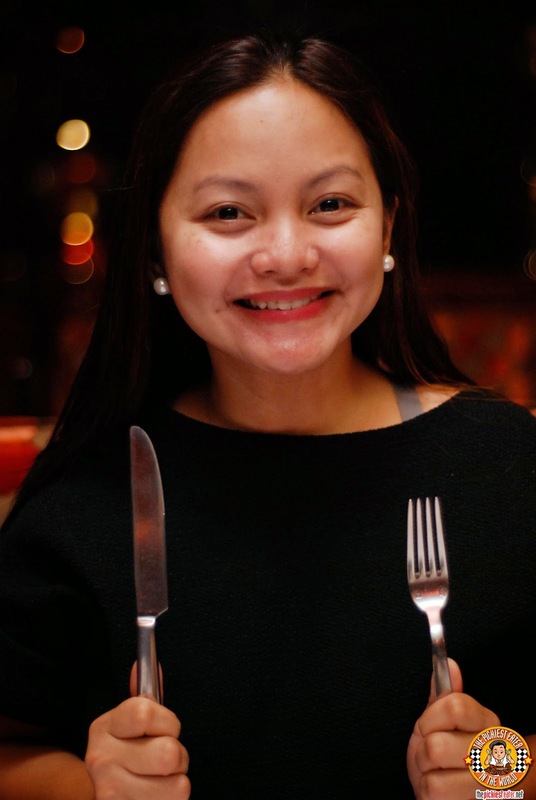 True, we eat out all the time for the blog, but this time I wanted to take her out to a romantic dinner, not because we need content for "The Pickiest Eater", but because we simply wanted to celebrate our union together, and the blessings that have come our way. Rina let me do the choosing for the restaurant, but had said that she wanted steak, which as a testament of how she and were truly destined for one another, was exactly what I wanted as well. 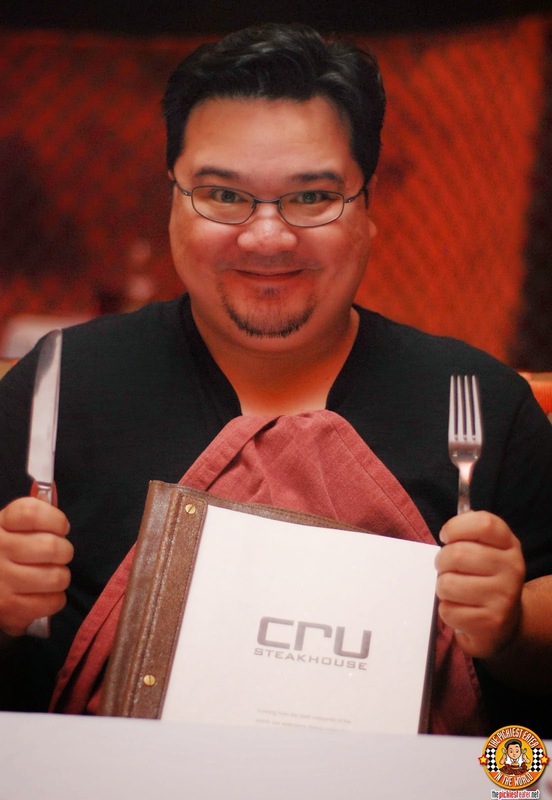 I had earlier researched some places where we could go enjoy a nice steak dinner, and one of the names the cropped up was Cru Steakhouse in Marriott Hotel. After the whole license debacle, Rina and I decided to postpone our date, while keeping Cru on the list of possible candidates. 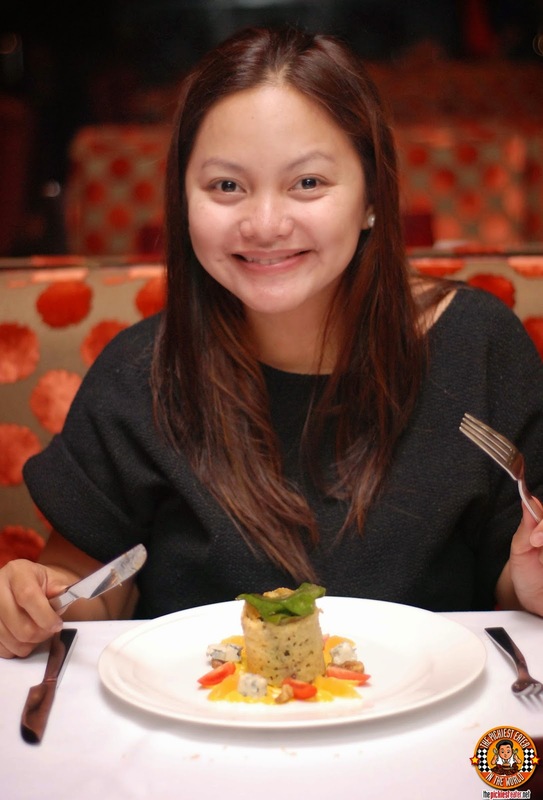 A week later, my friends from Marriott Manila invited me to get a taste of the world renowned Marriott experience. 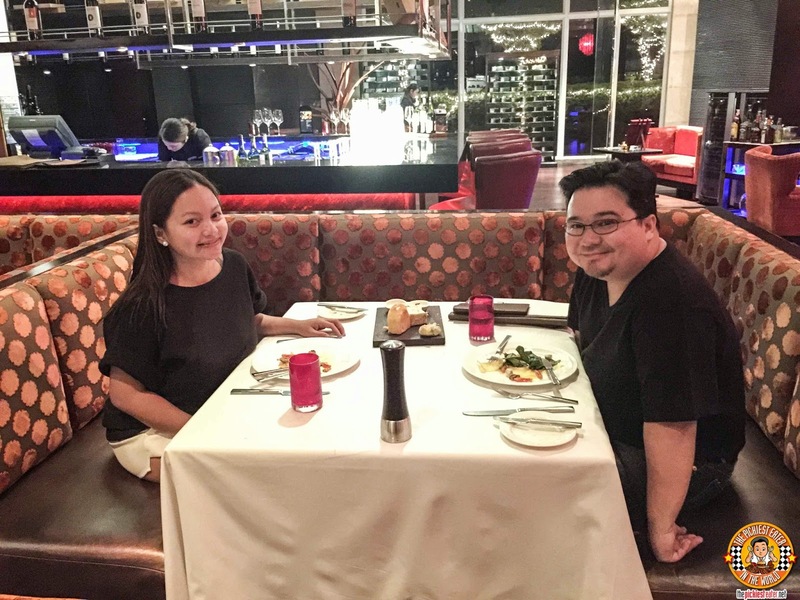 Apart from the overnight stay in a beautiful Executive Room, we were given a special surprise..
A romantic Three Course Steak Dinner for two at Cru Steakhouse.. The Perfect way to celebrate our anniversary! 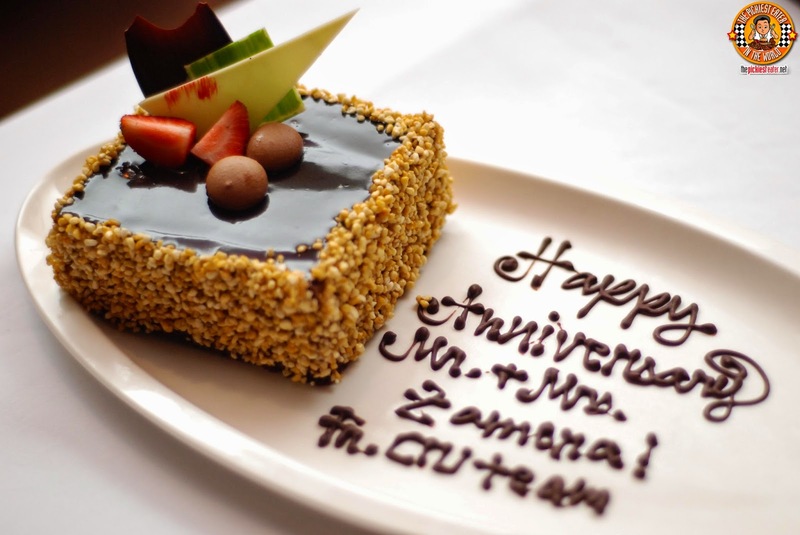 The year 2014 ended on a high note for Cru, as it received the "Best Hotel Fine Dining Award" in the Manila's Best Kept Restaurant Secrets Awards, adding yet another accolade to the numerous others it has already attained. 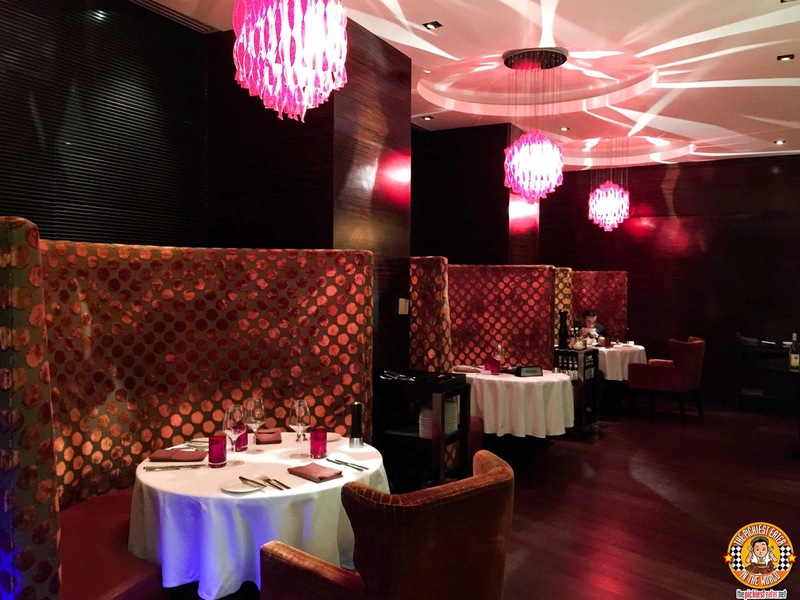 The place is definitely elegant and classy, with its hard wood floors and sophisticated interiors. The comfortable lounge chairs, however, gives Cru a more welcoming ambiance. 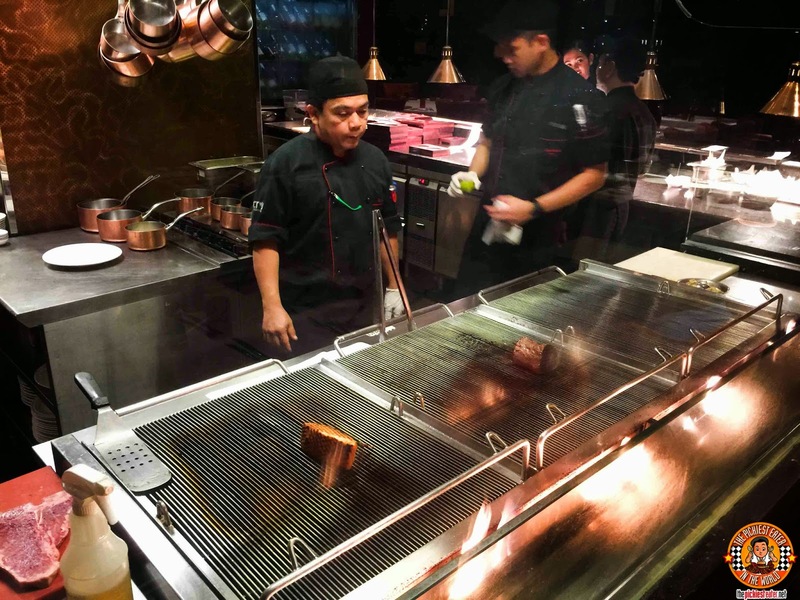 The grill station is kept deliberately open, giving the customers a chance to see their steaks being seared to their liking. 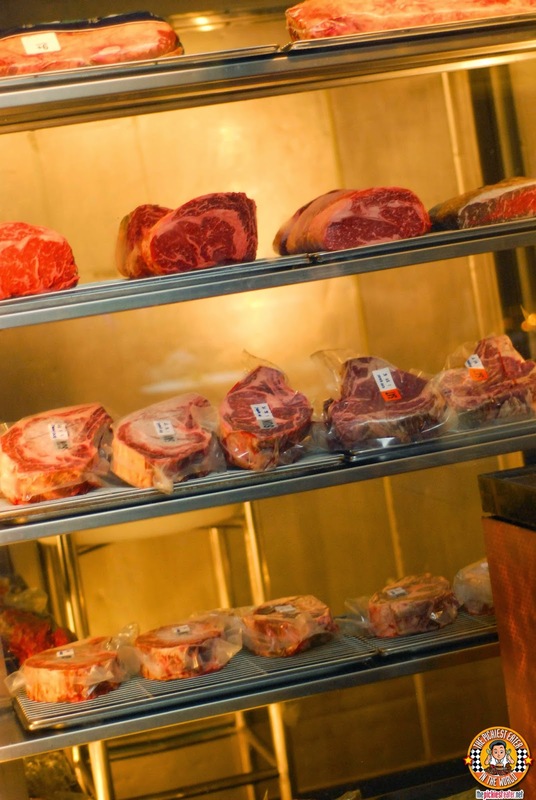 You may decide to choose your cut of steak from the wide selection on display in the chiller. After our meal, you have no idea how badly I wanted to grab one and stuff it down my shirt and run off, but unfortunately, my shirt was a little too tight, that NOTHING could fit in there afterwards. Criminal intentions aside, I was there to enjoy an enchanted evening with the most special person in my life.. Whose reply to me after I said, "I love you" to her was a stomach growl that would put the mighty Mufasa to shame. 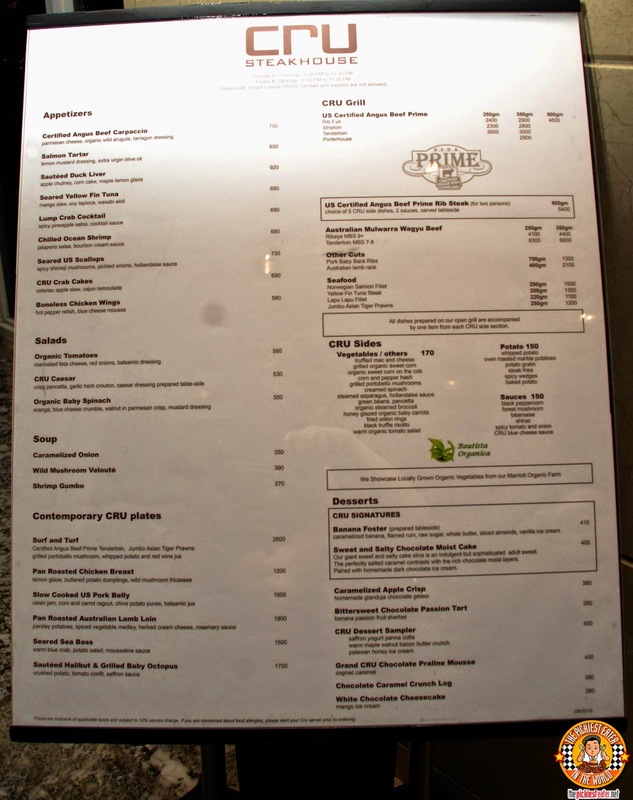 Though we were treated to a Three Course Steak Meal, the meal actually consisted of Seven different dishes - Nine if you count the three different types of bread that they served, which was a delicious assortment of Parmesan, Pesto, and Tomato dinner rolls. Each gave off a different note of flavor, Nice cheesiness on the Parmesan, Delicate herb infused flavor to the Pesto, and a light touch of acid from the Tomato. 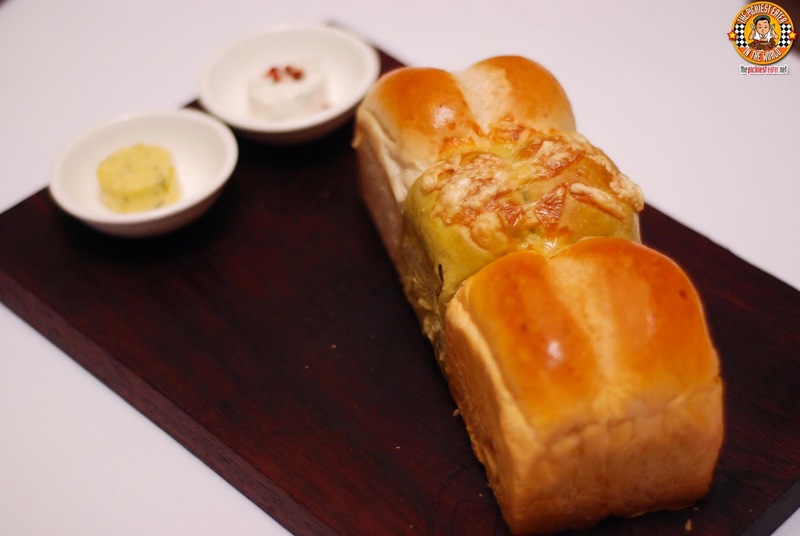 Watching the butter slowly melt into the warm bread brought a smile to my face. 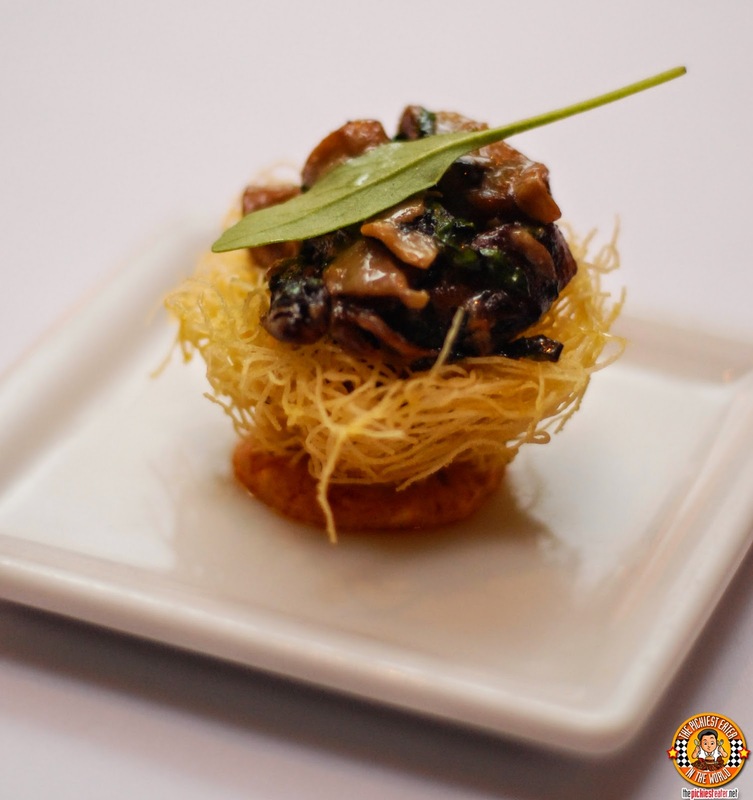 Next, we were each served an Amuse Bouche, in the form of some sauteed mushrooms on some sort of a crispy nest. I ate everything in one bite, and I was surprised with how the mushrooms let off a savory flavor to get with its tasty earthiness, with the "nest" adding some texture. 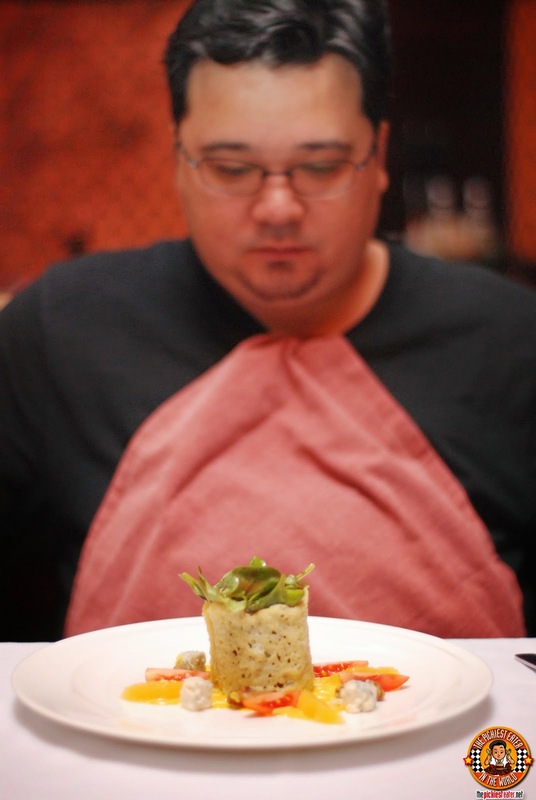 Then the next dish was placed in front of us. As you can see, it was a salad. And as you can see, Rina and I had contrasting reactions to it. The Baby Spinach Salad is technically the First course of the three course set meal. Though I normally have an aversion to salads, Rina urged me to try this. I was pleasantly surprised to discover that it wasn't your average, ordinary salad. 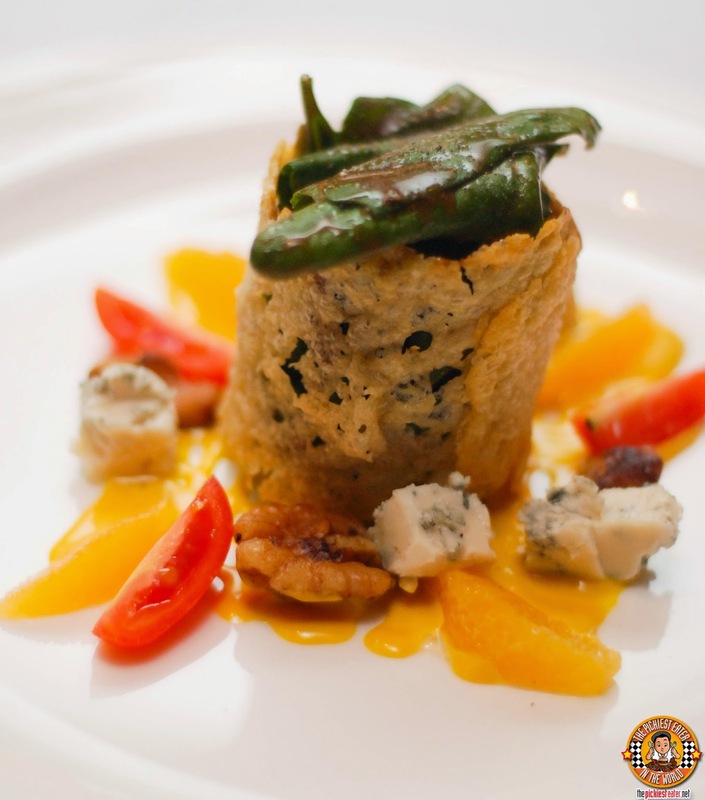 Spinach leaves are wrapped in a toasted Parmesan crisp, and sprinkled with bits of crumbled Bleu Cheese, Candied Walnuts, then finally, orange and tomato slices. The elements are then drizzled in a light mustard dressing, for a great adding a touch of acid to go with the menagerie of flavors, such as the sweetness of the oranges, and the sharpness of the cheese. My favorite part though (surprise, surprise), was the addition of the Parmesan crisp, which was quite delicious, and made eating the spinach leaves a whole lot easier for me. 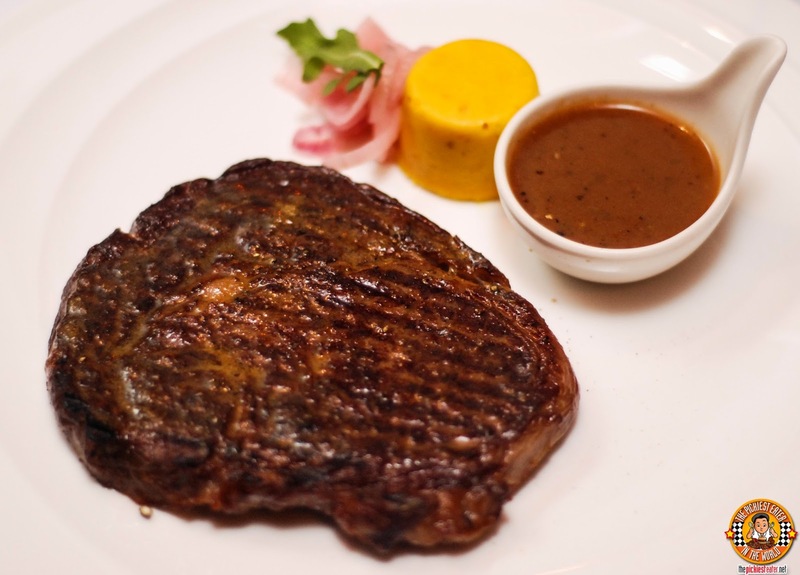 The main event was of course, the 250g Grilled Certified Angus Beef USDA Prime Rib Eye. I know what you're thinking.. 250 grams doesn't sound all that filling, but you'll be surprised. It was thinner than what I was expecting, but it was big on its amazing meaty flavor. The meat had gorgeous char marks on it, that helped bring out the natural flavor of the beef, nearly making the Black Peppercorn Sauce that it comes with unnecessary. Another wonderful component to this was the Gorgonzola & Corn pudding, that had a subtle but sharp saltiness that perfectly complimented the steak. 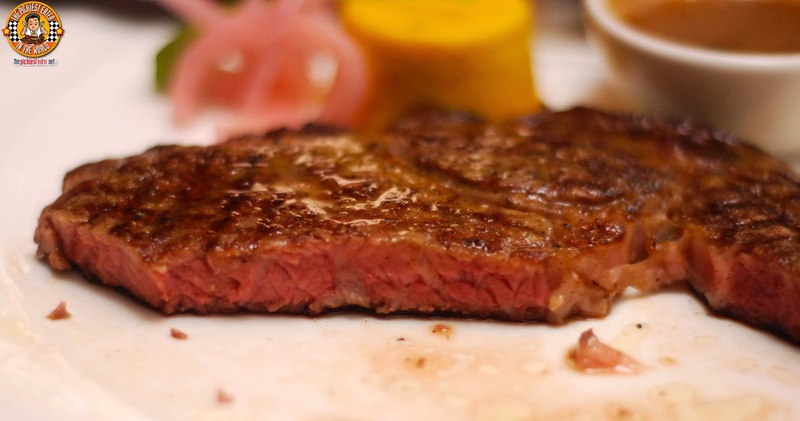 The steak was seared to a stunning medium, with the breathtaking marbling evident, ensuring the juiciness of the meat. A light slice with the knife cut through the meat with the greatest of ease. Easily among the best steaks I've had in my life. 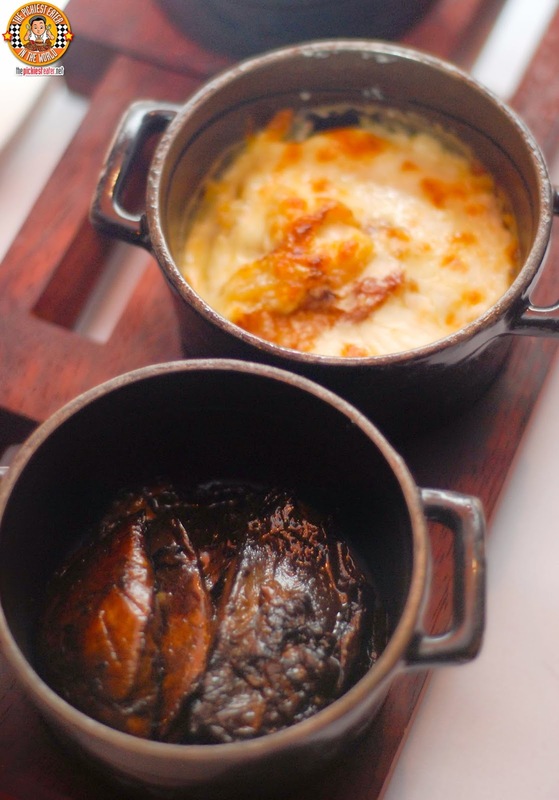 Apart from the Rolls, Amuse Bouche, and the Salad, the Steak also comes with two different sides.. A Potato and Onion Gratin, and Grilled Portabello Mushrooms. I loved the harmonious blend of cheese and potatoes in the gratin, while Rina immensely enjoyed the Portabello Mushrooms. The finishing touch to our epic meal, was the White Chocolate Cheesecake. Nice mix of creamy and tart, but I've had better cheesecakes elsewhere. 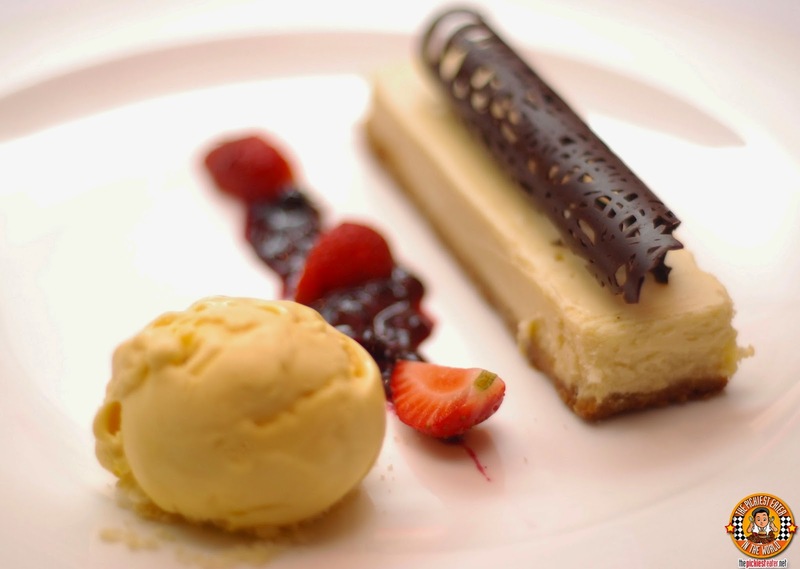 The pairing of the Cheesecake with the Mango Ice Cream and Strawberry Coulis was a great idea. 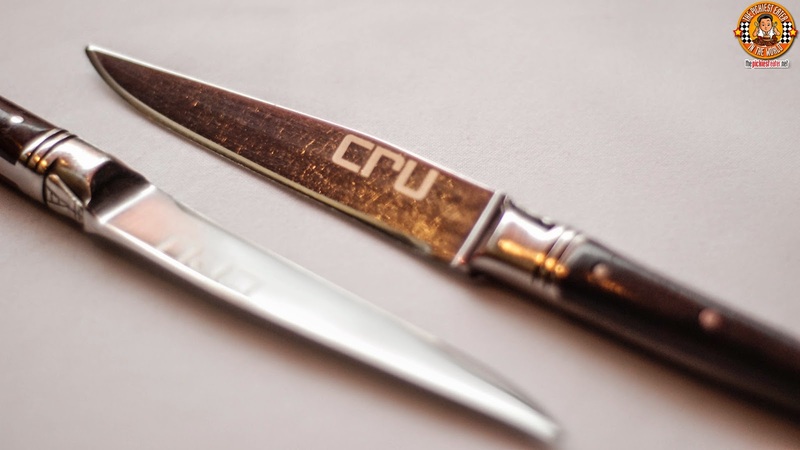 The service of Cru Steakhouse is without a doubt, of world class standard. The servers, especially Raffi, the one assigned to us, was one of the most pleasant, efficient attendants that I have had the pleasure of enjoying my meal with. We hadn't even burped out the steak we had just wolfed down, and we were presented with a special surprise from the Cru Team! A delicious cake with a special dedication was brought out to us by the Cru team, with a special greeting card signed by the staff, to boot! Rina and I would like to sincerely thank Cru Assistant Restaurant Manager Femee Osteikoetxer for taking great care of us during our dinner. 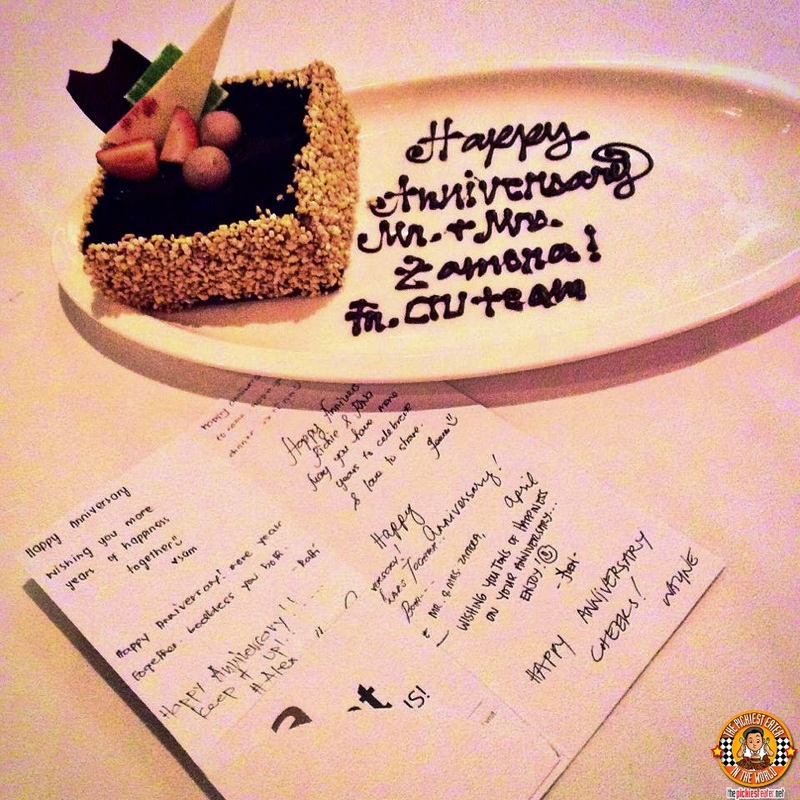 She and the entire Cru Crew pulled out all stops to make sure our Anniversary date was one for the ages! 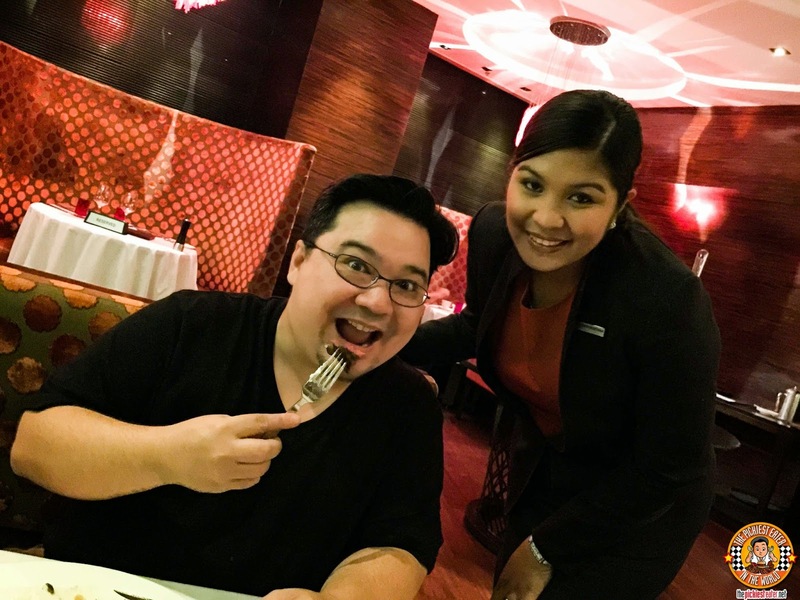 A special shoutout to Marriot General Manager Bruce Winton, Director of Marketing Communications Michelle Garcia, and of course, Marketing Communications Manager, Aimee Lagman for their kind hospitality! Thank you for the bottom of our hearts! 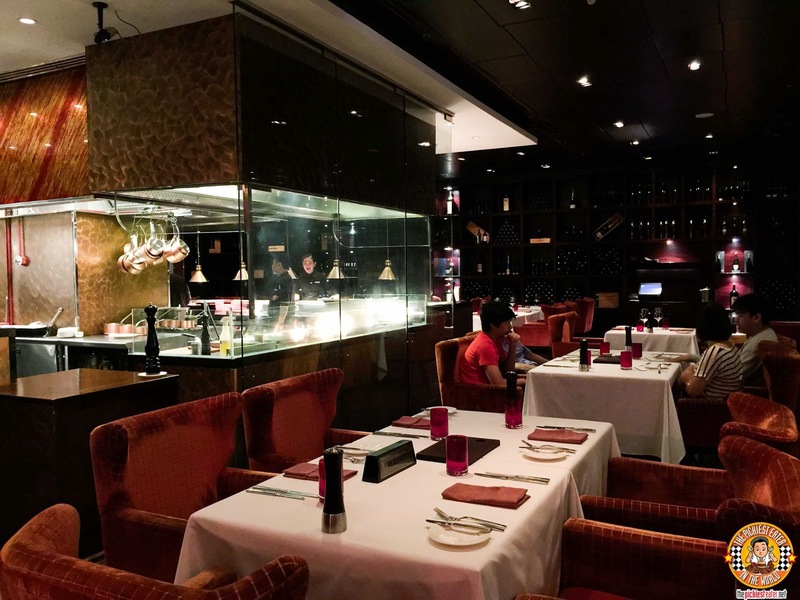 Cru Steakhouse deserves all the accolades that it has received. 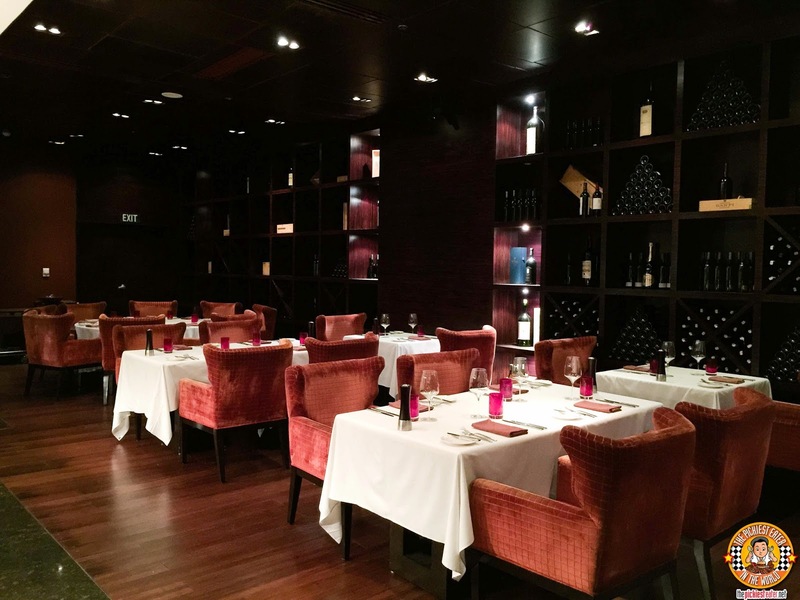 As you would expect from a fine dining restaurant located within a world renowned hotel chain he prices are undoubtedly on the steeper side, but Cru Steakhouse makes it a point to make sure you get your money's worth! Haha! The steak stood out more for me! Thank you Sheena! I wish I could take credit for that, but my wife does the photography.. and I think she's pretty good, considering she's self taught!